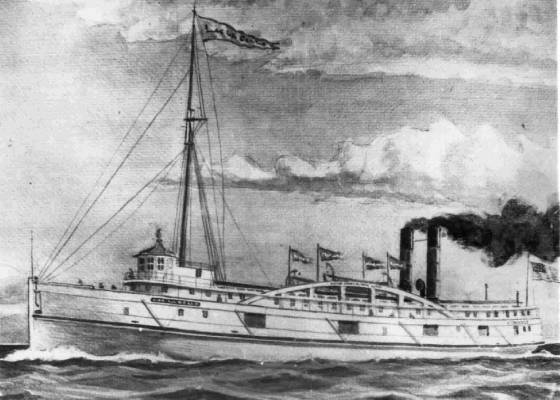 Brothers James and Joseph Evans found themselves trapped in the flooded engine room moments after the steamer Milwaukee drove its bow into the side of the propeller Lac La Belle. The accident happened early in the evening of Nov. 23, 1866 on the St. Clair River, about three miles above the flats where the river empties into Lake St. Clair. Joseph Evans said the water rushed into the Lac La Belle's engine room with such force that he and his brother dropped what they were doing and dashed for the ladder leading to the main deck. James, who served as chief engineer, never made it. He drowned in the swirling waters. Joseph escaped by a strange twist of fate. He said the water rose up over his head and carried him away from the gangway to an almost certain death. Then as the boat settled to the bottom of the river, the water carried him back out through the open gangway. He found himself afloat in the river where other members of the crew pulled him to safety. Steward Henry Rudd of Buffalo also died. He was crushed when he fell between the two boats while attempting to jump to the deck of the Milwaukee. The ship's clerk, a man named Davis, was nearly crushed to death when the bow of the Milwaukee crashed through the side of the wooden wall into the captain's cabin, where he was working. He climbed up on a chair and reached through a window to grab the Milwaukees rail. As the Milwaukee backed off, Davis held on and was pulled through the window to safety. A general unfamiliarity with the St. Clair River by one, if not both pilots, probably contributed to the accident. Both boats were on strange new courses. Both crews were used to normal trips between ports on Lake Michigan and rarely traveled in this part of the lakes. The Milwaukee had been at the Detroit dry dock for repair and was on its way back up the river with a load of pig iron and coal, bound for Milwaukee. The Lac La Belle, that mostly carried passengers and freight between Michigan and Wisconsin ports, was carrying iron ore, copper, potatoes, cedar posts, fish and ship's knees on a trip downstream to Cleveland. The vessels collided at a bend in the river at about 6:30 p.m. A board of inquiry determined that the Milwaukee was too close to the American side of the river when it struck the Lac La Belle on the port side. Captain Trowell, master of the Milwaukee, said his vessel went aground in the flats and had just worked free minutes before the crash. Remarks made to a news reporter indicated that both Trowell and Alex McFarland, first mate on the Lac La Belle, were confused about whistle signals and rules of river passing. "We saw the broadside lights of a downbound steamer and blew two blasts on the whistle to notify that we would pass on the starboard (Canadian) side," Trowell said. He said he heard no answer but watched in horror as the Lac La Belle turned so that the two boats were on a collision course. The rules of the road were to pass to port (or right side) of the river after blowing one blast on the whistle. Two blasts indicated a desire to pass to starboard, which was only done in cases of emergency. Before it was done, both pilots had to agree and sound double blasts on the whistle. Wheelsman William Walker, who was in the Lac La Belle's pilot house with McFarland, said the mate "blew one blast of the whistle and told me to port the wheel." This implies that McFarland may not have heard the other boat's signal or was confused about how to respond to it. "Seeing that the steamer was heading right for us (McFarland) blew again one blast," Walker said. "When he saw that a collision was inevitable, the mate ordered the wheel hard-a-starboard so as to swing the boat and receive a glancing blow. Within two minutes the boats met with great force, the steamer striking us about 40 feet from the bow." After the crash, the Lac La Belle began to burn. They said the collision apparently caused a kerosene lamp to fall to the deck and tipped a wood-burning stove. While sunk in only 25 feet of water, the ship's upper cabins were still above the water line, where smoke could be seen pouring from the doors and windows. Trowell, who kept his vessel standing nearby to help rescue survivors, said he pulled the Milwaukee alongside so his crew could string a fire hose and put out the fire. "Our own boat in the meantime was discovered to be on fire. The crew extinguished the flames with buckets," He said. The board of inquiry ruled that both pilots shared the blame for the accident. The Milwaukee was operating too close to the American shore and the mate of the Lac La Belle was in error when he tried to pass the Milwaukee on the wrong side. The Lac La Belle was raised the repaired. The ship was lost in a gale on Lake Michigan in 1872.